The first 4 tracks of this 6-track album range in length from 18 seconds to just over a minute and a half and consist of random percussion, feedback, lo-fi bleeps, and noises that all scurry around each other searching for a song. The rest of the album is similar, but with track 5, The Fox Eating a Tire, clocking in at 5 ½ minutes, and the final track, Counting to Six running over the half hour mark, they give the band time to stretch out and try a few things. Well, in the case of Counting to Six, they try a lot of things. Lets just say this track definitely comes with extra noodles. The Fox Eating a Tire sounds like a windstorm blowing through a cluttered garage, with some eerie, twisted guitar effects thrown into the mix. It almost morphs into a bit of a little jam number by the end, with psychedelic, bluesy overtones. And then comes the "epic" Counting to Six. Billy Corgan of the Smashing Pumpkins once took a whole bunch of little bits and pieces of unfinished studio songs from the Mellon Collie and the Infinite Sadness sessions and edited them together into one long piece. That's sort of what Counting to Six sounds like, except from a space rock launching point. We get loads of eerie, sci-fi movie sound effects, creepy electronic burps and bleeps, washes of lo-fi synths, crashing percussion, curious guitar and organ playing, toy trumpets, and some very Pink Floydian moments (the word "moments" is stressed here) reminiscent of that band's Umma Gumma period (especially the live version of Saucerful of Secrets). I want to like this, I really do, but just as you start getting into it, it veers off on a totally different tangent from where it was going, which in the end, is a little frustrating. What it all ultimately amounts to is a band with a lot of intriguing ideas that could produce some great music with a little more focus. 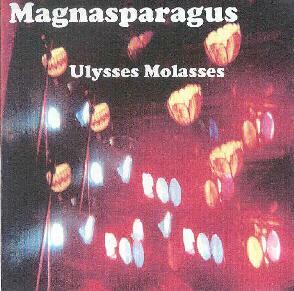 Admittedly, I haven't heard anything else by Magnasparagus (great band name, by the way! ), but this work intrigued me enough to want to hear more.